Music thrived in 2008. For every show on my best of list, there was at least one I wished I’d seen. It was also a year of discovery. Almost half of the top ten includes performers I witnessed for the first time. These evenings of live music proved to me that the creative spark is alive and well, even if the business is in the doldrums. Gully Boys @ Middle Earth Music Hall (2 February) – This working class band captures the essence of the area scene. Every member has a day job, and they get together because they want to. “If it ain’t fun, it ain’t worth doing” is their motto. This annual “reunion” night, at the soon-to-close Bradford Hobbit Hole, was particularly inspiring, with a Dead-length set that ran past 1 AM. Trixie Whitley @ Bellows Falls Opera House (26 April) – Nothing prepared me for the raw emotion of this night, a tribute to the memory of Chris Whitley. Trixie seemed to muster courage and strength with each note. By the end of the evening, she’d won the crowd as well as the artists who’d come to play her father’s music, memorably sitting in with her brother Dan and headliner Alejandro Escovedo. Robert Plant & Alison Krause @ B of A Pavilion (5 June) – There was no Led Zeppelin reunion this year, and it likely won’t happen in 2009 thanks to Plant. He’s having too much fun with T-Bone Burnett, Buddy Miller and fiddler/vocalist extraordinaire Krauss. The acoustics at this waterfront show weren’t the best, but the sheer joy on stage made up for that. “Black Dog” never sounded so good. 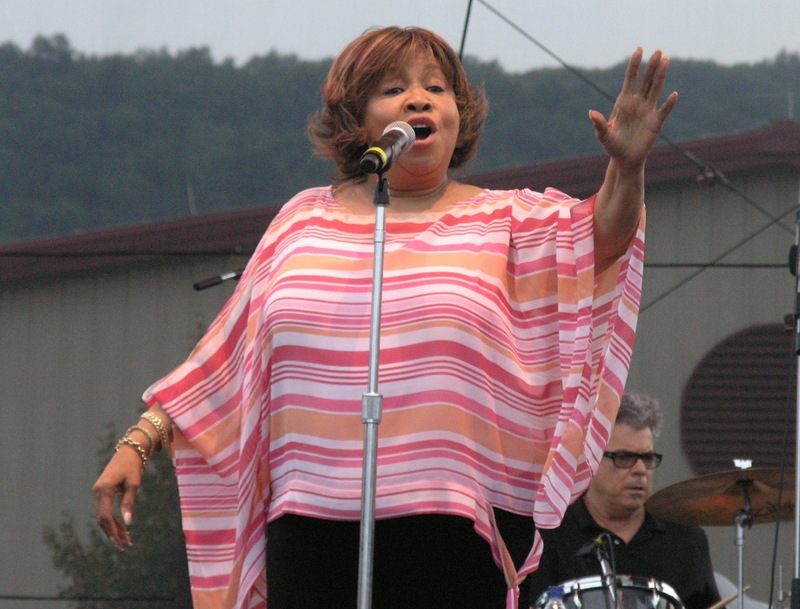 Mavis Staples @ Green River Festival (19 July) – She marched with Martin Luther King during the civil rights movement, which she called “the struggle,” and in the weeks following Barack Obama’s Democratic primary win, Staples performed with extra punch and power. She reinvented “For What It’s Worth,” added a personal note to “Down In Mississippi” and brought many in the crowd to tears. Collective Soul @ Meadowbrook (9 August) – In a de facto battle of the bands with Live and Blues Traveler, this sonic force of nature came out on top. Toward the end of their set, lead singer Ed Roland hauled over a dozen fans up on the 8-foot high stage, to the shock and dismay of security. One of the best nights at the region’s number one outdoor music facility, which won’t stay a hidden gem for long. Lindsey Buckingham @ Lebanon Opera House (12 October) – Tickets for the upcoming Fleetwood Mac reunion are trending towards 300 dollars, but I doubt a night at the Enormodome could top this intimate show. Buckingham indulged his muse with several obscure Mac nuggets, performed multiple encores, and even took time out to sign a fan’s 35 year old copy of “Buckingham/Nicks”. Molly Venter & Cahalen David Morrison @ Canoe Club (3 December) – Two musicians who’d never met before this night, thrown together by circumstance and management, traded songs while a room that often buries the talent on stage with dinner conversation stopped and took notice. It wasn’t perfect, but it felt magical nonetheless. Vienna Teng @ Iron Horse (8 December) – My best night of 2008 was, coincidentally, the last. In a perfect world Teng, a literate songwriter and scary good piano player, would be a star on the order of Sarah MacLachlan, whom many have compared her to. Instead, she was on a 5-show club tour with Peter Bradley Adams, with nothing more luxurious than XM radio in the rental car towing her trailer from town to town. Along with her fellow family members in the Staples Singers, Mavis Staples provided a soundtrack for the American civil rights movement, something she refers to simply as “The Struggle”. 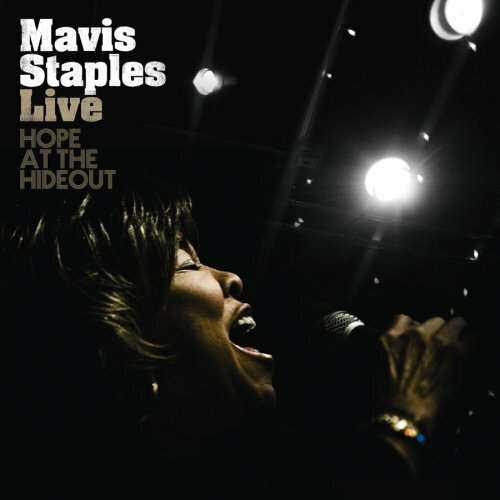 So it’s fitting that Staples would release the stunning live collection “Hope At The Hideout” on November 4, the day the United States elected its first African-American President. Working in front of an intimate crowd in her hometown of Chicago, the 69-year old singer brings ferocious energy to protest songs and spiritual standards. Much of the material is drawn from the 2007’s Ry Cooder-produced “We’ll Never Turn Back,” but it’s more raw and immediate in this setting, with the audience behaving less like patrons in a club than parishioners in pews. She leads off with a growling rendition of Stephen Stills’ “For What It’s Worth” and never lets up from there. Highlights include J.B. Lenoir’s swampy “Down In Mississippi,” given a powerful autobiographical touch with Staples’ story of colored-only water fountains. On “Wade In The Water” guitarist Rick Holmstrom channels John Fogerty while Mavis leads the group, which includes her sister Yvonne, in a rousing call-and-response. There’s a sense of living history throughout, but never more so than three songs at the record’s center, offered in sequence. She brings the same fierce determination to “Why Am I Treated So Bad” that Pops Staples did when he wrote it in response to a Martin Luther King sermon. “Freedom Highway” brims with hope and optimism; on “We Shall Not Be Moved,” Staples recounts a confrontation at a southern lunch counter a mere 45 years ago. After performing a rousing encore of “Will The Circle Be Unbroken” Staples isn’t ready to leave the stage, so she launches into an equally spirited “On My Way”. The audience’s energy level acts like an extra instrument, as shouts and whoops of joy punctuate her (as one writer so vividly put it) “honey and grits” voice . Unwilling to let the night end, she finishes with “I’ll Take You There,” one of her biggest Staples Singers hits. “I’ve had such a good time, “ she finally thanks the crowd. “I’m home – so I guess I’ll come back tomorrow night.” You’ll probably do the same, and let this inspiring live album go immediately for a second spin.